You’ve heard of them on the news and seen shocking programmes about them, but how do you know rogue traders won’t affect you? Any kind of home improvement work proves to be exciting for home-owners. You have an idea in your head and you want to get cracking on it straight away. That is the trap many people fall in to – being extremely eager to start may mean rushing into picking a company who you haven’t researched into fully. As sad as it is, rogues in the landscaping industry can be extremely common. 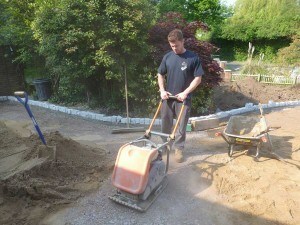 Landscaping is an unregulated industry meaning anyone can ‘have a go’ – even those who have had no experience at all. Don’t get caught out. Watch out for these ‘tell-tale’ signs of Rogue Traders! × Offering cheap quotes – Companies who offer cheap quotes could be rogue traders or may just be inexperienced in the industry. They may not know the British standard of installation and so will save on price. Although cheaper work may sound great in hindsight, cheap work may mean cheap products, inexperienced staff, and landscaping work that fails. Fixing poor work can sometimes prove to be more expensive than picking a quality company who charge a little more in the first place. × Available to start work right away – Although you may think this is great to start with, this is not a good sign. Availability to start straight away means they have no other projects to finish first- which may mean no one else wants to use them or it may even mean it’s their very first attempt at completing a landscaping project. Professional landscaping companies will have a lot of work on, so waiting a few months for a quality installation is better than having a poor installation completed immediately. × Offering verbal but not written quotes/contracts – If you decide to go with a company who do not give you written documents be very wary. Professional landscaping contractors will provide a document regarding aspects such as the length of time the project is expected to last, how much deposit should be paid upfront and payment terms. By receiving a verbal contract/quote, you will have no record to see what has already been agreed on. This may mean agreeing on a certain figure when in reality the ‘cowboys’ have no intention to sticking to it! × Not offering references – A good landscaping company will want to share the happy thoughts of their previous customers to their perspective ones, so companies that don’t offer you references may have something to hide. × Unwilling to offer you details about their business – for example an address or telephone number. This may mean they move around a lot or may simply mean they don’t want you to be able to contact them after the work has been completed. × Asking for money upfront – A reliable landscaping company won’t ask for the money up front – payment is normally taken in stages or in full at the end of the project. × Cold calling on your property advertising work – Professional landscaping companies will not cold call on your property. Reliable landscaping companies will have a website or social media accounts where they can advertise their services. × No vision when planning your garden – When designing a garden, most homeowners will have a clear vision of what they want, but be wary of companies who do not give you their input. Quality landscapers will have had tons of experience in installing gardens and should therefore have lots of vision – this may mean suggesting different materials they think may work well or advising on practical features such as water management systems. How will I know which landscaping companies are professional and reliable? → Check sites such as The APL (The Association of Professional Landscapers), TrustMark, BALI or Marshalls. These sites will be able to advise on professional landscaping companies who are continually vetted to confirm they install to British standards. →Check for qualifications/awards/experience – professional landscaping contractors will have relevant qualifications and awards. → Check their websites/social media pages. These should have pictures of previous projects they’ve completed and should also feature testimonials of their previous customers. → Only agree to landscaping work after receiving a written quote/contract with both your and their signature on.